Throwback | Tell Me… Am I From This World? If you are an avid Instagram user, you are definitely aware of the hash tags #tbt or #throwbackthursday. Every Thursday, users will post their pictures from way back when and reminisce the old times. The feelings are kinda nostalgic and chocolate-box as you go down memory lane. What does throwback mean? According to Merriam-Webster Dictionary. So, to throw back means to bring something back from the past and with Instagram, we do this by posting pictures, mostly our baby pictures or those of our parents when they were still young and available. Hehehe. I love looking at old pictures and wonder what was I thinking that day or if any decision made then have created an impact on who I have become now. I couldn’t help but enjoy how I looked like then and wonder what the @#?% happened to me that I wasn’t able to maintain the cuteness I had when I was younger. Hahaha!! Okay, I can’t do anything about it anymore. But since we are talking about ‘throwbacks’, even if it’s not yet Thursday, I’ll post our picture taken in 1986 and have a good time seeing my siblings in their 80s fashion–shoulder pads, high-waist skirts, wide belts and the amazing bangs!!! Nyahaha!!! 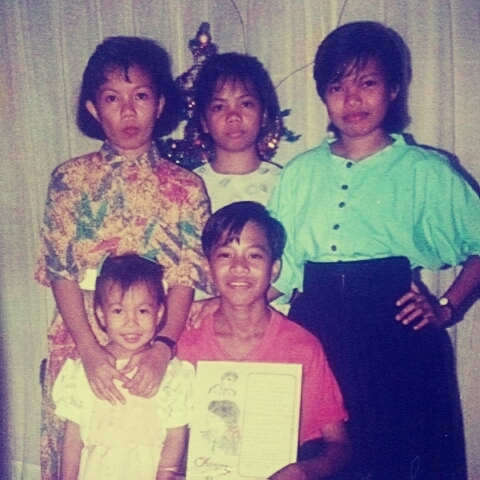 L-R Clockwise: Our Eldest Mildred, 3rd Sis Mercie, 2nd Sis Mimie, our only Brother Rhey and little me! Previous PostMy Fave Filipino Gospel SongNext PostThose Final Words..